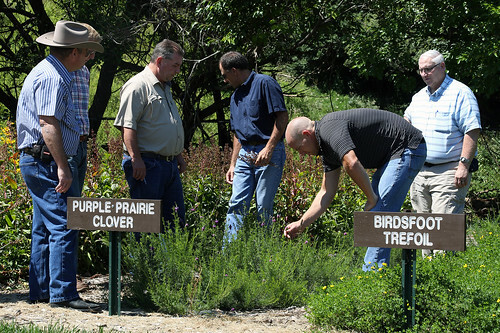 A resource specialist with NRCS discusses features of the purple prairie clover planted in the plant material plots. USDA photo. 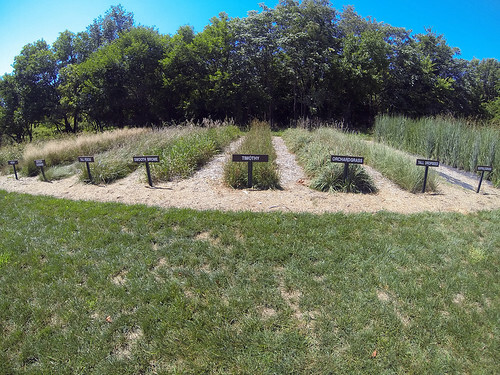 A new garden consisting of plants used in conservation work is now open in Champaign, Illinois to train staff members of USDA’s Natural Resources Conservation Service (NRCS) as well as conservation partners. NRCS has planted a total of 33 different varieties of plants consisting of cool-season grasses, warm-season grasses, legumes and forbs. While the garden was developed to train staff, the garden at the NRCS office is also open to the public on weekdays. “The garden began a new life two years ago when NRCS’ Plant Materials Center in Elsberry, Missouri supplied the plants, equipment and staff with assistance from a local Boy Scout troop to establish the plots,” said Kerry Goodrich, NRCS state resources conservationist. Between the drought, rabbits and squirrels, the garden had a rough beginning. “But with great love, care and replacing dead plants, the plots are now established and today are perfect specimens for all to view,” Goodrich said. 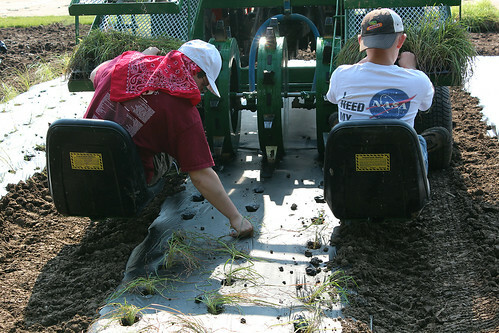 Boy scouts from a local troop planted grasses while sitting on the back of a mechanical planting machine. USDA photo. The garden showcases a variety of species, all clearly marked. The different species provide NRCS staff, soil and water conservation district employees, as well as partners, such as Pheasants Forever and the National Wild Turkey Federation, a chance to identify plants during different growth stages and understand their benefits, he said. In late summer, visitors will see eastern gamagrass, an excellent grass for hay production, and big bluestem reaching more than six feet tall. Big bluestem can be used for prairie restoration, wildlife cover, roadside plantings, native gardens and prairie landscaping. Smaller grasses such as smooth bromegrass and orchardgrass form a nice ground cover, which are typically used for wildlife food and nesting cover, erosion control and food for livestock. Legumes like alfalfa, ladino clover, purple prairie clover and birdsfoot trefoil show blooms during early to mid-summer, and these plants are known for their ability to add nitrogen to the soil. 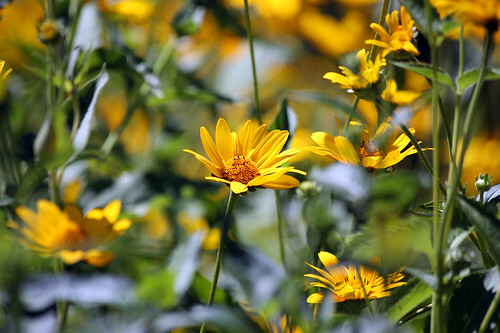 The blooms of the oxeye false sunflower show a blanket of yellow blooms in late summer. USDA photo. And then the wildlife friendly forbs such as grayhead coneflower, pale purple coneflower and oxeye false sunflower stay showy most of the summer. Many farmers used these on their land for prairie restoration, wildlife food and cover, prairie landscaping and native gardens. The plots not only serve as a training ground but also adds beauty to the grounds as well as feeds local birds and pollinators. It’s an educational opportunity year-round for all to enjoy. Each plot is three feet wide and 30 feet long with a three-foot walkway between each of them. USDA photo.